What are some of the best electric travel guitars? If you are reading this page, you are probably interested in learning more about travel guitars, please read on! 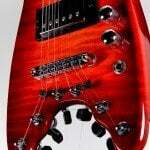 Our travel guitar reviews are focused on electric travel guitars. Most likely, the reason you are searching for a travel guitar is to find something that is as small and convenient as possible. The best travel guitars for portability are arguably electric in nature since you don’t have a big acoustic sound box to carry around. Electric travel guitars are typically fabricated with a “headless” design. 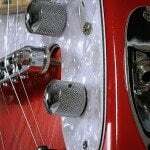 The machine heads (or tuners) are located on the bottom (or sometimes in the middle) of the guitar body. These features allow the smallest possible “footprint” for the guitar, making the them portable and easy for traveling. 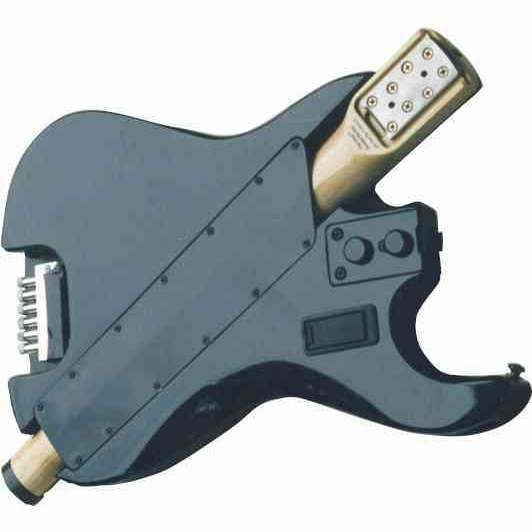 Some of the early headless electric guitars were made by Steinberger (see review below). Besides small size and portability, headless guitars are known for outstanding sustain and resonance. 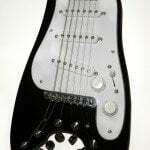 The strings are anchored to the top (nut end) of the guitar neck passing maximum vibration into the neck and back into the vibrating guitar system. A guitar with a headstock loses string vibration energy that dissipates when the strings pass over the nut and into the machine heads. A headless guitar preserves that energy and feeds it back into the guitar’s resonant vibrating system. 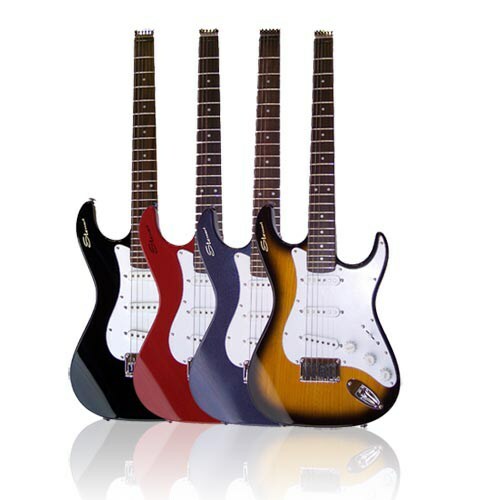 There are many brands and types of electric travel guitars to choose from. Travel guitars range in price from about $300 to well over $2,000, with custom models running over $5000. 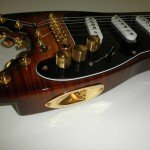 You probably want something that plays and sounds like a real guitar, or maybe you just want something with a fretboard to keep your fingers in shape when you are out on the road. Some manufacturers offer easily detachable necks to make it easy to stash your axe in your carry on luggage or computer bag. The travel guitar reviews are listed in alphabetical order with no particular recommended travel guitar. You can browse the specifications and price ranges to help you decide which is the best travel guitar for you. Offered by Erlewine Guitars at $599, you have probably seen one of these travel guitars being played by Marty McFly in the movie “Back to the Future”. Claimed as the original travel guitar, it has a single humbucking pickup and a tunable bridge for practice, composition and (yes!) performance. 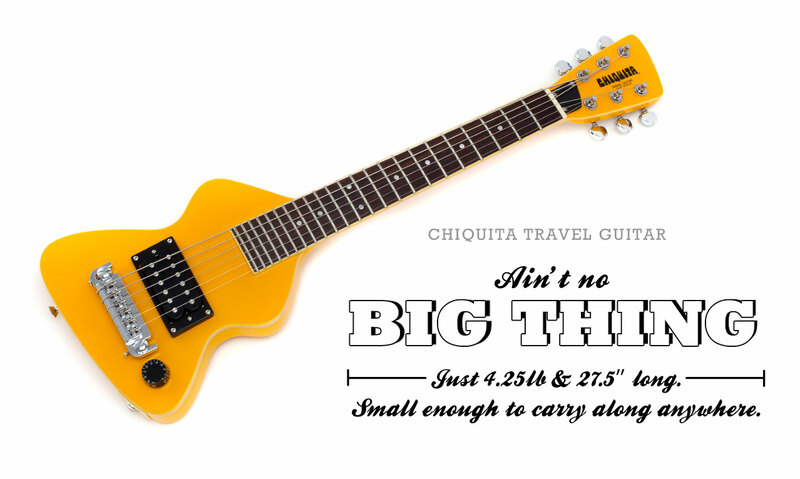 The Chiquita comes in at a little under 28” long, weighing a little over 4 pounds with a short 19” scale length and 23 frets. Also offered as a left-handed version for an additional $105. Moving up the line, Erlewine offers the Lazer II headless travel guitar for $1499 which sounds like a Strat and feels like a Gibson®. 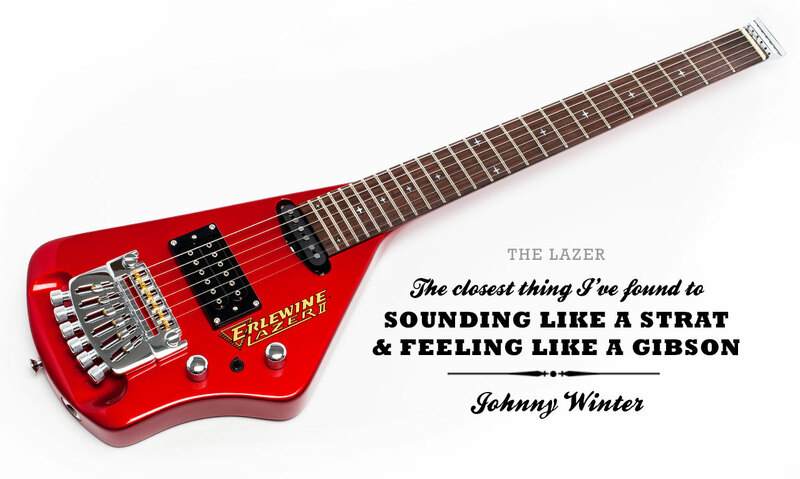 The full scale 24 fret Lazer features a patented headless tuning system and uses regular ball end strings. Length is 31” and weight is a little over 5 pounds. Controls include Volume, Pick up selector and a push-pull Tone pot. Pickups include a ‘59 style humbucker in the bridge position and a Alnico single coil in the neck position. A hard-shell case is offered for an additional $120. 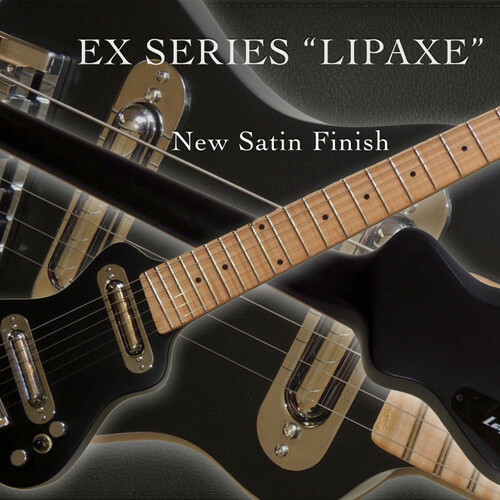 Based in Singapore, Lap Axe manufactures several models of headless short scale (18” to 22”) travel guitars with one or two pickups and tone and volume controls. 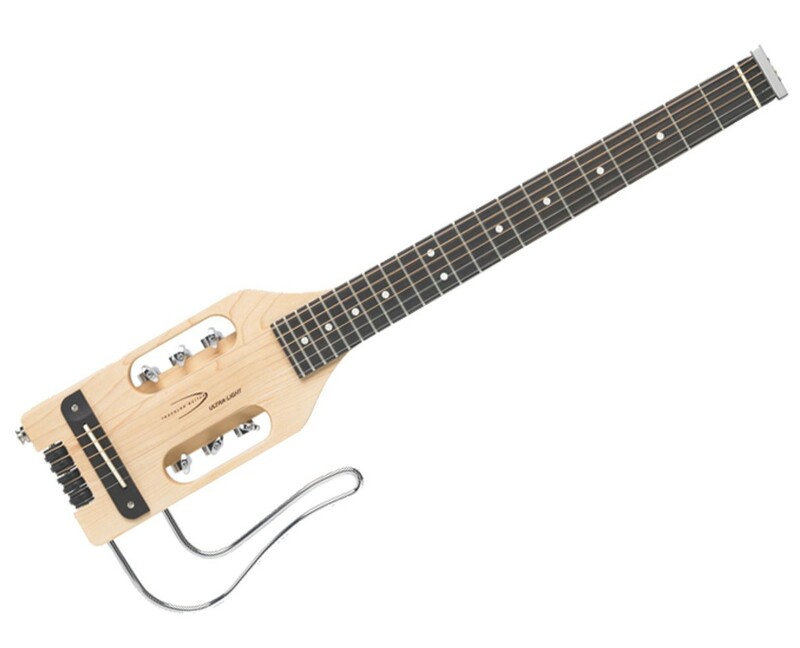 Claimed to be the “smallest portable electric travel guitar available”, the Lap Axe travel guitar's overall length is about 25” and it weighs just under 4 pounds, but does not come apart. The 20 fret necks include graphite support rods and a double action truss rod. 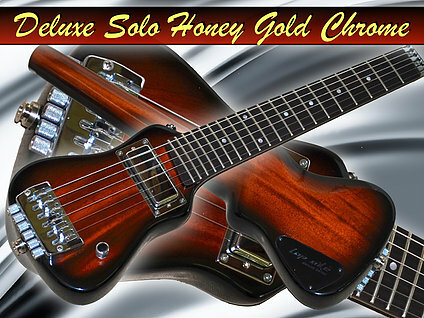 Various pickups are available including Mini Humbuckers, Single Coil Lipsticks and Hot Rails. Stick end of the strings are captured at the top of the non removable neck with small set screws. The ball ends of the strings are anchored in the tunable bridge. Prices start about $500 for the Deluxe single coil version and go up to over $800 for the EX model. Available with dual humbucker or single coil pickups, controls include a 3 way switch with a Volume and Tone control. Uses a standard Gotoh GE-103B bridge. Prices range from about $950 to $1000. There was nothing like Ned Steinberger’s guitars and basses when they were first introduced in 1979 with their lightweight and headless design. The GTR-PRO 6-string electric guitar features a Poplar body and Hard Maple neck and tremolo bridge. This travel guitar is about 30” long. The bolt on neck has a 1960's style D profile, 24 medium jumbo frets, with a 14” radius and 25.5” scale length. Available in a variety of colors and weighs about 7 pounds. 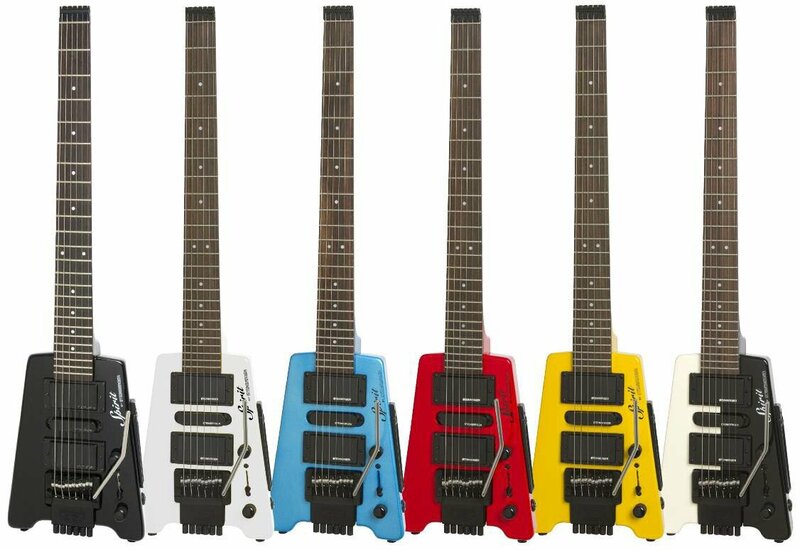 One thing to note is the Steinberger requires special double ended strings. The Steinberger GT-PRO is powered by Steinberger’s versatile humbucker pickups in the neck (HB-2) and bridge (HB-1) positions along with full-range Steinberger SC-1 single coil pick up in the middle position. 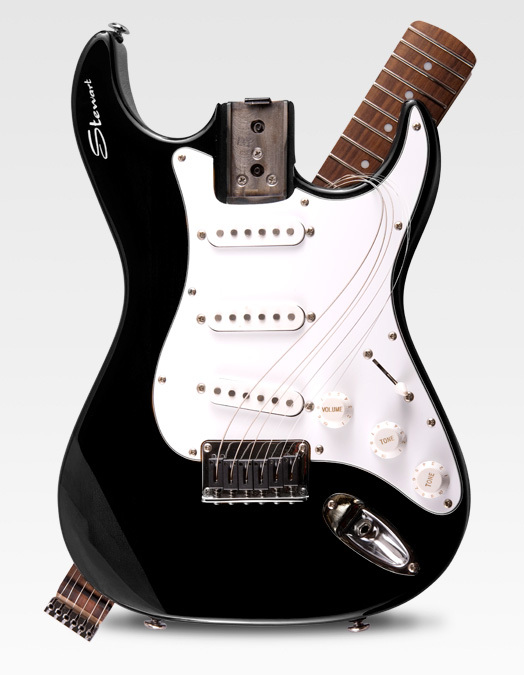 Controls include Master Volume, Master Control, and a 5-way pickup selector. The GT-Pro runs about $400, with a $50 adder for a Quilted Maple veneer top. 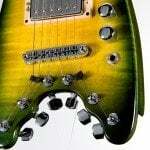 Stewart Travel Guitars utilize a detachable headless neck system to minimize the size of an otherwise full size STRAT style electric guitar using their patented Clip-Joint™ neck c connection system. The strings stay attached to the top of the neck and the body so they can be placed in your roll aboard luggage when traveling. The Stow-Away™ ranges in price from $679 - $929 with an Alder body in a variety of colors. Strings are loaded from the back of the guitar through the machine head assembly and up through the bridge saddles. They are locked into place at the top of the neck with a set screw and tuned from underneath the body with the knurled tuning knobs. Weighing just under 7 pounds assembled, the full size body measures 18’ x 12’ x 3.5”. The 22 fret full scale (25.5”) Maple neck with Amaranthus (like Rosewood) fretboard is 19” long with a 14” radius. The STRAT motif is complete with a three ply pickguard, three single coil Alnico pickups, five position switch Volume and two Tone Controls, and a STRAT style output jack. Strandberg makes headless guitars that are quite portable. Manufactured in Sweden, they use a neck profile known as the EndurNeck™, kind of like a flattened triangle shape. The guitars normally come with 24 frets. The original Boden model features a Swamp Ash body with a Flamey Maple top and a Maple neck and sports a pair of Suhr humbucker pickups. The guitar weighs about 5 pounds. Cost is about $2200 USD and is available with a tremolo bridge. 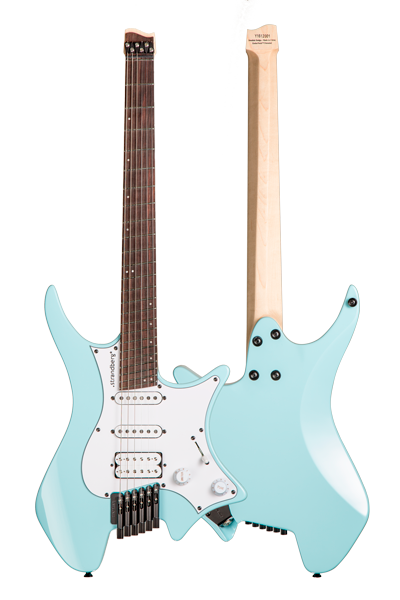 Also available is the Boden Classic, with a nod to a Strat style layout. This model starts at about $1300 USD and comes with two single coil pickups and a humbucker in the bridge position with a 3 way selector switch. The Boden Classic has an Alder body and comes in Sonic Blue, Black or White. It has a Maple neck with Pau Ferro fingerboard and is only available with a fixed bridge. Other Strandberg models are available including custom guitars that share the same overall design, construction and hardware but allow the customer to choose the body and neck materials as well as the scale length. The guitars are produced in batches from previously submitted applications. 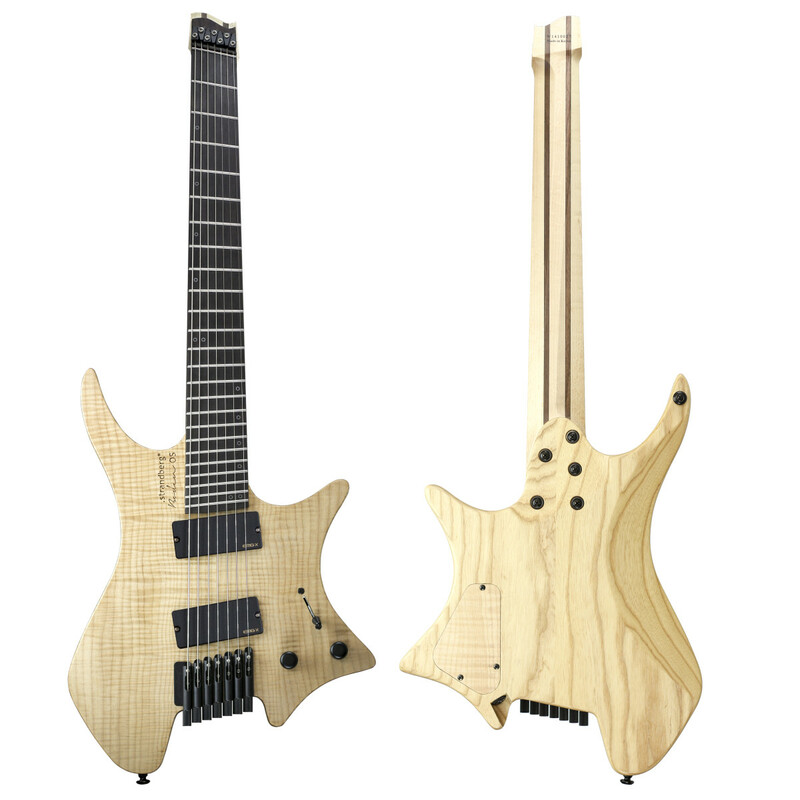 They offer 6, 7 and 8 sting models with custom Strandberg prices start about $5000USD. 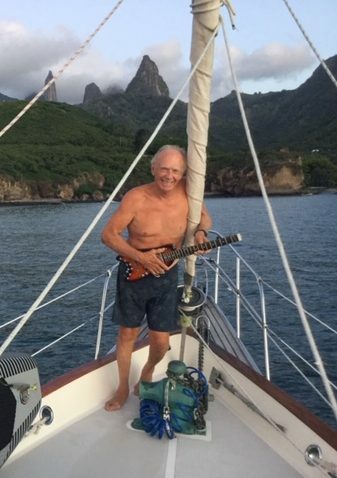 Traveler guitars have been around since 1992. At the low end of their product line is the “Ultralight”, pretty much the same as the original concept developed by pilot Leon Cox in the early 1990’s. It is a 22 fret full scale instrument, measuring 28” long, weighing about 3 pounds with tuning machines located in the middle of the body. 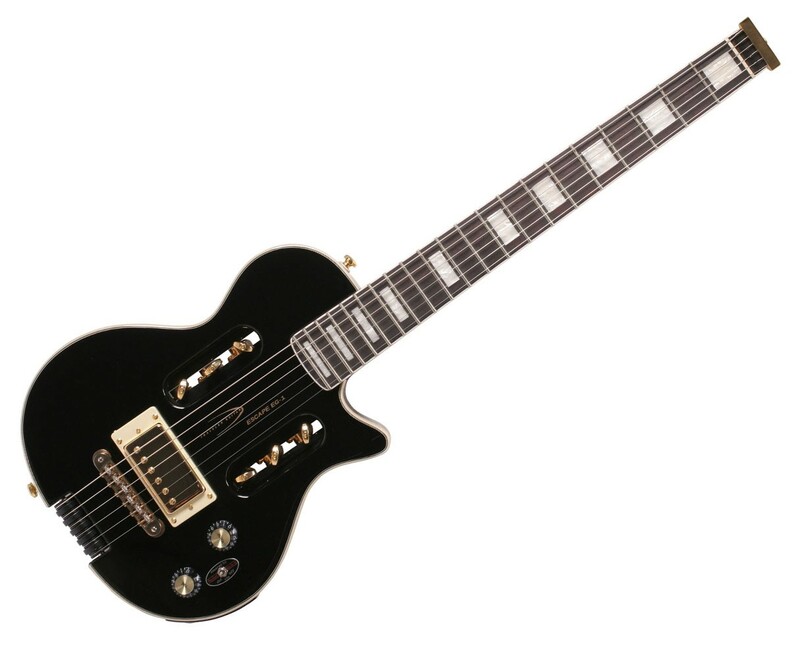 It has a dual rail humbucker pickup with a ¼” output jack, and comes with a detachable leg rest. The original models came with a stethoscope device with earplugs so you could hear the guitar without an amp. The ball end of the strings are anchored to the top of the non-detachable neck, with the strings passing around a series of rollers on the bottom of the guitar and making their way to the interior mounted tuning machines. The “Ultralight” sells for about $300. At the high end of the Traveler product line is the EG-1 Custom V2 selling for close to $550. 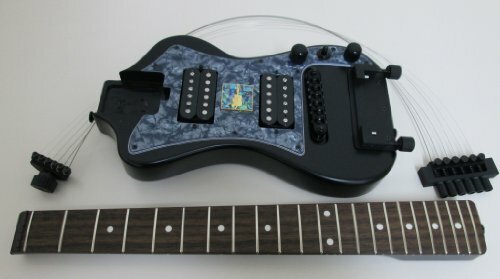 Still sporting a full scale 21 fret non-detachable neck, it includes active electronics (requiring a 9V battery) and a built in headphone amplifier as well as a built in tuner. The overall length of the EG-1 is a little over 28”, it weighs about 5 pounds. The pick-up is a single full sized Alnico humbucker. The tuning machines are mounted in the middle of the somewhat Les Paul shaped body with a tone and volume control and adjustable bridge. The string mounting and roller system are similar to the “Ultralight”. The body is Alder, and the neck is Mahogany with a Rosewood fretboard.